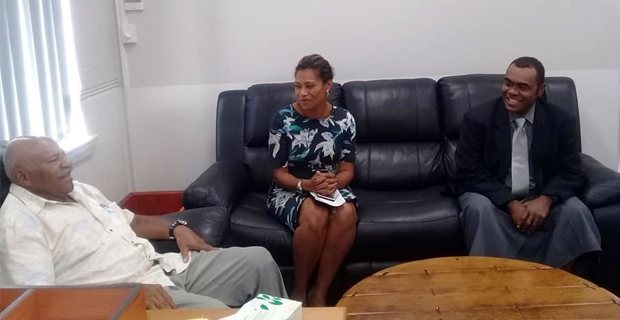 Leader of Opposition Sitiveni Rabuka confirms that he met with SODELPA MP’s Lynda Tabuya and Mosese Bulitavu today where the differences between the two members were amicably resolved. This was after reports emerged about Tabuya and Bulitavu’s alleged heated exchange. It is alleged that Tabuya questioned Bulitavu’s authority when he allegedly sent an email to SODELPA members about the ireguregu for the late Speaker of Parliament, Dr Jiko Luveni. Rabuka says that SODELPA is a multiracial political party having its own institutional and structural mechanism to resolve any differences between its members. He says that there is bound to be differences in opinions which are normal and encouraged a diverse political party like SODELPA to foster better communications, an essential characteristic of any truly democratic institution. Rabuka says that it his duty to defend the freedom of speech and expression of citizens. Rabuka says that it was an attempt in vain to destabilize the Opposition and project them as divided. He says that SODELPA is stronger and more united than ever before. Rabuka says that they will always place issues of national importance first and foremost than issues of political expediency used by their detractors to paint an adverse picture about them. He says that any attempts to revive the past or to divide and destabilize SODELPA or the Opposition would be proven futile as in this case.